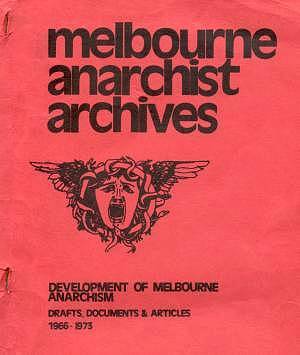 This collection of Melbourne Anarchist documents for the period 1966-73 is the first in a series of papers we hope to produce on the history of Australian Anarchism. The object of such a series of publications is not simply that of contributing to the historiography of the Australian left but is rather that of contributing towards the development of the present movement by the critical study of its past. Indeed even to exhibit such a past is to contribute towards the unification of the present movement for many anarchist individuals in Australia are unaware that they form part of a tradition. By identifying this tradition - or strictly those traditions since several streams have come together in the current movement - we give the atomised individuals something to relate to; by criticising this tradition we can do something towards ensuring that our past is behind us. Both these aspects are important if Australian anarchism is to develop. In the absence of a living tradition to relate to, groups come into existence and die away without there being any overall development in the movement and people enter the movement and develop theoretically and practically within it as individuals without the movement as a whole developing with them. The development of individuals within the movement is thus a prerequisite of the development of the movement but is not identical with it. The development of the movement requires that individual development takes place publicly and is communicated. Communication between individuals and groups separated in space can be facilitated through conferences, interstate visits and internal bulletins; communication between those separated in time can only be done through the study and criticism of our history. Because as wide a circle as possible - ideally the whole movement - should take part in this critical study it has seemed desirable to publish collections of documents and memoirs of participants where possible rather than imposing upon the reader a finished historical essay with analysis and conclusion but with no data for the reader to arrive at an independent judgment. Some such essays may be published on the early movement but where possible the more recent groups will be treated through the publication of archival material. The present publication does not provide a complete picture of Melbourne Anarchism in the 1966-73 period since leaving aside its omission of the Spanish and Italian migrant groups - it is almost entirely confined to what may be called the Melbourne/ La Trobe current. This current which started with the group TREASON at Melbourne University in 1966 included the Melbourne Anarchist League and "Black Rag" Group as well as La Trobe Anarchists; the other current which started with the "Solidarity" group in 1969 included the magazines "Assassin" and "Outlaw" and ended with the Working Peoples Association and Free Store in 1973. Although the original intention was that this publication would cover Melbourne Anarchism generally the selection principles used - a restriction to original theoretical and political statements or illustrative journalism containing a political or historical interest - led to nearly all the available material from the "Solidarity"/ Free Store current being excluded. As a result it was decided to prepare a second study based on memoirs to deal with this current and to print illustrative documents in an appendix to it. (The most important of these is the manifesto of the Anarcho-Surrealist Insurrectionary Feminists which was one of the two fragments formed by the disintegration of the Free Store Group.) When this has been done a much better picture of Melbourne anarchist activity will emerge; for the moment the current document will serve to illustrate the pre-history of the ideas that went into the FAA organisational document and La Trobe issues of the FAA bulletin. In presenting the essays and documents below it need hardly be pointed out that not all of them are equally good or well-written. Despite this we believe that there is a development which transcends the ageing of particular individuals and that the tradition exhibited in them is a valuable one worthy of critical study and further development. N.B. Whilst most of the articles were published in newspapers, newsheets or pamphlets some are drafts which were not completed or not intended for publication. Ho For The Merry Month of May! Fighting on Two Fronts: Against the University Administration; Against the Student Maoists. b. What is to be done? To whom? c. What is to be undone. 1973: What is to be done? Student Activism: A Return to the Mid-Sixties? * Draft article not originally published or not originally intended for publication.